"Long known for the cocaine trade and kidnappings, Colombian rebel groups and criminal gangs have turned from drug sales to illegal gold mines to fund their activities. Those mines are increasingly responsible for driving people out of their homes. Colombia has the second-largest number of displaced persons worldwide, just behind Syria, according to the United Nations." A man who was herding his flock of animals in the far flung, gold rich and also restive region of Xinjiang in north-western China, came across quite a golden fine. He found a 17 pound nugget of gold, shaped like the map of China. This is not a pure gold nugget but a natural gold ore mixed with quartz and other minerals. Still worth a pretty penny. "No Chinese companies have ever directly participated in the 95-year old price-setting ritual that takes place twice daily by phone between four banks. ICE Benchmark Administration was chosen in November to run the replacement, after silver, platinum and palladium ditched daily fixings last year. Chinese gold demand has more than doubled since 2009. “We are encouraged by the number of firms who have shown interest in being participants in the new, electronic auction,” Finbarr Hutcheson, president of IBA, said in the statement. “Expanding the number of participants in the auction will increase the transparency and robustness of the data” and better represent the market price, he said." Ukraine had sadly been on a road leading to nowhere for the last few years, and they really seem to have switched to high gear over the last year. A few months ago, there were a lot of "stories" about Ukrainian gold being loaded into unmarked trucks and flown out of the country in the middle of the night. The most recent head-scratcher comes from their Central Bank branch in the southern port city of Odessa. It seems that we have some more gold swaps happening and for once we are referring to a literal swap and not a financial instrument. 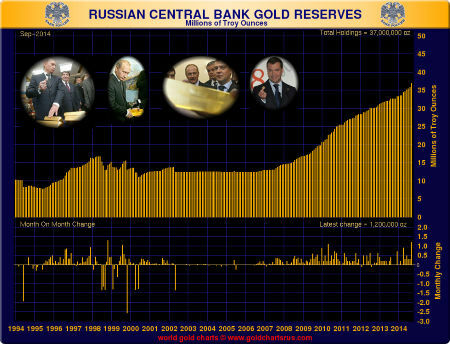 RT reports that 11 kilograms of the Ukrainian Central Bank's gold is missing or more accurately, it has been swapped with 11 kilograms of painted lead. "Cunning fraudsters have conned the Ukraine Central Bank branch in Odessa into buying $300,000 worth of gold which turned out to be lead daubed with gold paint. “A criminal case has been opened and we are now carrying out an investigation to identify those involved in the crime,” a spokesman for the Odessa police force is quoted by Vesti. The news was first reported by Odessa’s State Ministry of Internal Affairs. A preliminary investigation suggests the gang had someone working for them inside the bank that forged the necessary paperwork to allow the sale of the fake gold bullion. It’s also been discovered that bank staff were not regularly checked when entering or exiting the premises." Those keeping up with various gold commentary would have noted that the last couple of months have seen a lot of bearish calls on the price of gold. Some are short term while a few do call for gold (and silver) being stuck in a longer term downward or sideways trend. Harry Dent is one of them. His main argument and investment thesis in general is based on demographics and he has outlined his views in the book The Demographic Cliff. Mr. Dent believes that the demographics for the developed world have peaked and we will see drops in consumer demand across the board and general deflation for the next 5 to 10 years with gold going along for that downward ride - hitting $700/oz or lower. The upside being in the much maligned US dollar. Aaron Task from Yahoo Finance interviewed economist and NYU professor Nouriel Roubini to talk about his views on the defacto "currency wars" that are being undertaken by several countries, all trying to devalue their currencies to gain an export advantage. Roubini talks about the Bank of Japan's actions in particular and also comments on where he sees the price of gold heading. Hint: he sees gold going lower even as central bankers try to outdo each other with currency debasement via interest rate cuts or money printing. On November 30th, the Swiss people will embark on a national referendum tackling three issues, one of which relates to gold. They will vote on whether their country's central bank (Swiss National Bank) should hold at least 20% of its reserves in the form of gold and also repatriate all existing Swiss gold held in the United Kingdom and Canada. This has been on the radar of almost all the gold bugs and gold, silver and financial sites have been talking about this potential move for weeks, if not longer. It should not come has a huge surprise that the Swiss central bank head, Thomas Jordan, is not in favor of any such moves as he believes that it would hinder his ability to conduct monetary policy moves. But it seems that the Swiss people definitely have something of a bone to pick with their government and the SNB considering the current economic climate and the latter's Euro peg, which as resulted in a huge increase in Euro holdings just as the Euro has weakened considerably against the US dollar. If gold were to end this year at its current price, it would be the first time in over 15 years that it would have seen two back to back years of annual price declines. And this is now being used by many of the (investment) commentators to further question the pricing power of gold. Ron Ensana of CNBC/MSNBC presents his commentary on gold as an investment and why it is under performing (video may auto run on the CNBC page). Ensana is of the view that the price of gold heads to $800 - same as ABN Amro - rather than $4,000 per ounce. "While it's true the nation's money supply has ballooned, along with the Fed's balance sheet, and other broad measures of money, the velocity of money (the speed with which money circulates through the economy, continues to fall. That is a factor that restrains inflation and augurs poorly for gold going forward. While gold might be good for a trade, if the dollar pauses from its recent, and rapid, ascent … to me, the longer-term view remains bleak." Leaders of several Islamic countries have dipped their toes in past monetary discussions of bringing back a gold backed Dinar. But these previous initiatives tended to eventually die out (sometimes quite literally). Now with ISIS/Islamic State being front and center when it comes to world news and trying to act like an official empire/Caliphate, we should have been expecting talk of a circulating currency. So queue a rebirth of the gold dinar (and silver dirham). The Daily Mail is reporting that ISIS is apparently looking to introduce its own currency in the Syrian and Iraqi territory under its control - and this currency will be based on gold and silver coins as defined by historic Islamic rules. "The currency known as the dinar, which once consisted purely of gold and silver coins, is today used by a variety of countries, but the coins are created from different materials to the originals. However, the jihadi group is understood to be planning to return to the original gold and silver coins, which were first introduced during the Caliphate of Uthman in 634 CE. The original Islamic dinar was a gold coin which was the weight of gold equivalent to 4.3 grams. Its silver counterpart, known as the Islamic dirham, was a silver coin equal in weight to 3 grams of silver. Both were round in shape and one side of the coin was typically stamped with an Islamic message, while the other side featured the date of minting and the country’s ruler."